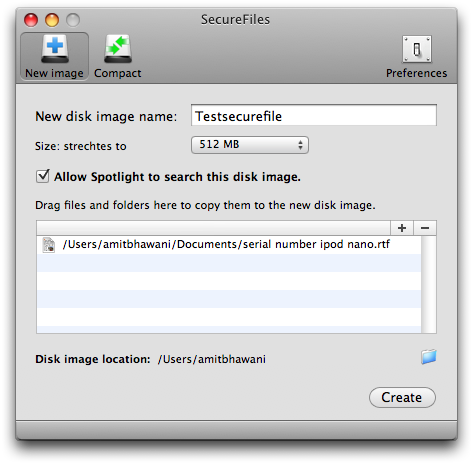 Securefiles is a macbook application which helps you create the most easily created volumes for sensitive files without any problem. The files which you want to be protected and disk images of the same would be created which are set with your password and you can open them when you enter the password. Until then, the files are always safe and encrypted. You can also have the password stored in the keychain or keep the same in your mind and nothing in your mac. Easy to install, just open the downloaded file and drag the application to Applications folder when instructed. Open the application, and then you have options to give a name to the files. You can set the maximum size of the disk image file. You can set whether to allow Spotlight to index the file for search or not. After all this is done, you can now drag all the files which you want to encrypt in that disk image. When you are done with that, create the image and set the password to open the file when you need it. Its very easy to use and understand, and you are shown the place where the disk image files are stored. There would be no point of making the encrypted disk image files, if you are not setting a password alongwith, so set a password for the DMG files. Disk Images are encrypted with a AES 128 bits algorithm.